اصغری, محمد, موحدی, بهروز. (1396). مطالعه پوشش سد حرارتی نانوساختار بر پایه اکسید زیرکونیا و ارزیابی خواص پایداری حرارتی و رفتار خوردگی داغ. نشریه علوم و مهندسی سطح, 13(34), 45-56. محمد اصغری; بهروز موحدی. "مطالعه پوشش سد حرارتی نانوساختار بر پایه اکسید زیرکونیا و ارزیابی خواص پایداری حرارتی و رفتار خوردگی داغ". 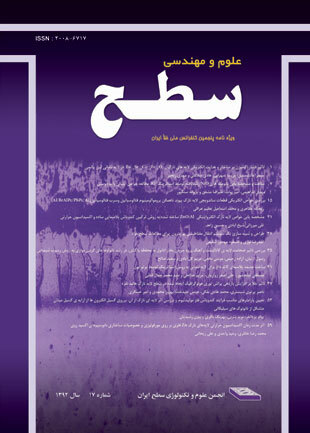 نشریه علوم و مهندسی سطح, 13, 34, 1396, 45-56. اصغری, محمد, موحدی, بهروز. (1396). 'مطالعه پوشش سد حرارتی نانوساختار بر پایه اکسید زیرکونیا و ارزیابی خواص پایداری حرارتی و رفتار خوردگی داغ', نشریه علوم و مهندسی سطح, 13(34), pp. 45-56. اصغری, محمد, موحدی, بهروز. مطالعه پوشش سد حرارتی نانوساختار بر پایه اکسید زیرکونیا و ارزیابی خواص پایداری حرارتی و رفتار خوردگی داغ. نشریه علوم و مهندسی سطح, 1396; 13(34): 45-56. در این مقاله هدف مطالعه رفتار خوردگی داغ و پایداری حرارتی پوشش نانوساختار سد حرارتی زیرکونیای پایدار شده با ایتریا (8YSZ) است. برای این منظور بر زیرلایه­ هایی از جنس فولاد زنگ نزن، دولایه پوشش از جنس NiCrAlY با ضخامت 150 میکرومتر و YSZ نانوساختار با ضخامت 300 میکرومتر توسط فرآیند پاشش پلاسمایی اتمسفری (APS) اعمال شد. آزمون اکسیداسیون چرخ ه­ای در دمای 1000 درجه سانتی­گراد و چرخه­های 10 ساعته به منظور ارزیابی پایداری حرارتی پوشش انجام شد. آزمون خوردگی داغ نوع اول در دمای 950 درجه سانتی­گراد به مدت 4 ساعت با حضور نمک­ های Na2SO4 و V2O5 صورت گرفت. نتایج نشان ­داد که پوشش نانوساختار YSZ با دانه‌های کمتر از 100 نانومتر به دلیل بالایی که در مقابل یون اکسیژن دارد، تاثیر قابل توجهی در کاهش رشد لایه TGO نداشته ­است. اما نتایج آزمون خوردگی داغ، تشکیل بلورهای YVO4 بر سطح پوشش نانوساختار YSZ را نشان می‌دهد که به دلیل نفوذ­پذیری بالای پوشش نانوساختار که از سطح تا عمق پوشش YSZ وجود دارد مقداری از وانادیم نیز به قسمت­ های پایین ­تر لایه نانوساختار YSZ نفوذ کرده است. 1. R.A. Miller, History of thermal barrier coatings for gas turbine engines, Glenn Research Center, Cleveland, OH, (2009). 2. R. Viswanathan, Combustion Turbine Hot Section Life Management, OMMI journal, (2002). 3. S. Bose, High temperature coatings, Butterworth-Heinemann, (2011). 4. W. Nowak, D. Naumenko, G. Mor, F. Mor, D.E. Mack, R. Vassen, L. Singheiser, W. Quadakkers, Effect of processing parameters on MCrAlY bondcoat roughness and lifetime of APS–TBC systems, Surface and coatings technology, 260 (2014) 82-89. 5. W. Chen, X. Wu, D. Dudzinski, Influence of Thermal Cycle Frequency on the TGO Growth and Cracking Behaviors of an APS-TBC, Journal of thermal spray technology, 21 (2012) 1294-1299. 6. S. Kyaw, A. Jones, T. Hyde, Predicting failure within TBC system: Finite element simulation of stress within TBC system as affected by sintering of APS TBC, geometry of substrate and creep of TGO, Engineering Failure Analysis, 27 (2013) 150-164. 7. M.R. Loghman-Estarki, M. Nejati, H. Edris, R.S. Razavi, H. Jamali, A.H. Pakseresht, Evaluation of hot corrosion behavior of plasma sprayed scandia and yttria co-stabilized nanostructured thermal barrier coatings in the presence of molten sulfate and vanadate salt, Journal of the European Ceramic Society, 35 (2015) 693-702. 8. C. Lamuta, G. Di Girolamo, L. Pagnotta, Microstructural, mechanical and tribological properties of nanostructured YSZ coatings produced with different APS process parameters, Ceramics International, 41 (2015) 8904-8914. 9. M. Daroonparvar, Effects of bond coat and top coat (including nano zones) structures on morphology and type of formed transient stage oxides at pre-heat treated nano NiCrAlY/nano ZrO2-8% Y2O3 interface during oxidation, Journal of Rare Earths, 33 (2015) 983-994. 10. D. Ghosh, S. Das, H. Roy, S. Mitra, Oxidation behaviour of nanostructured YSZ plasma sprayed coated Inconel alloy, Surface Engineering, (2016) 1-7. 11. P. Carpio, A. Borrell, M.D. Salvador, A. Gómez, E. Martínez, E. Sánchez, Microstructure and mechanical properties of plasma spraying coatings from YSZ feedstocks comprising nano-and submicron-sized particles, Ceramics International, 41 (2015) 4108-4117. 12. M. Pourbafrani, R.S. Razavi, S. Bakhshi, M. Loghman-Estarki, H. Jamali, Effect of microstructure and phase of nanostructured YSZ thermal barrier coatings on its thermal shock behaviour, Surface Engineering, 31 (2015) 64-73. 13. X. Ren, M. Zhao, C. Wan, Y. Zheng, W. Pan, High‐Temperature Aging of Plasma Sprayed Quasi‐Eutectoid LaYbZr2O7‐Part I: Phase Evolution, Journal of the American Ceramic Society, 98 (2015) 2829-2835. 14. X. Zhong, H. Zhao, C. Liu, L. Wang, F. Shao, X. Zhou, S. Tao, C. Ding, Improvement in thermal shock resistance of gadolinium zirconate coating by addition of nanostructured yttria partially-stabilized zirconia, Ceramics International, 41 (2015) 7318-7324. 15. Q. Huang, W. Yuan, W. Huang, H. Cheng, Y. Zhou, H. Liu, Effect of organic additions on the phase composition and crystal growth behavior of 8 wt% yttria-stabilized zirconia nanocrystals prepared via sol–gel process, Journal of Sol-Gel Science and Technology, 74 (2015) 432-446. 16. M. Gell, Application opportunities for nanostructured materials and coatings, Materials Science and Engineering: A, 204 (1995) 246-251. 17. J. Karthikeyan, C. Berndt, J. Tikkanen, S. Reddy, H. Herman, Plasma spray synthesis of nanomaterial powders and deposits, Materials Science and Engineering: A, 238 (1997) 275-286. 18. C.B. Liu, Z.M. Zhang, X.L. Jiang, L. Min, Z.H. Zhu, Comparison of thermal shock behaviors between plasma-sprayed nanostructured and conventional zirconia thermal barrier coatings, Transactions of Nonferrous Metals Society of China, 19 (2009) 99-107. 19. B. Liang, C. Ding, Thermal shock resistances of nanostructured and conventional zirconia coatings deposited by atmospheric plasma spraying, Surface and Coatings Technology, 197 (2005) 185-192. 20. R.S. Lima, B.R. Marple, Thermal spray coatings engineered from nanostructured ceramic agglomerated powders for structural, thermal barrier and biomedical applications: a review, Journal of Thermal Spray Technology, 16 (2007) 40-63. 21. W. Wang, C. Sha, D. Sun, X. Gu, Microstructural feature, thermal shock resistance and isothermal oxidation resistance of nanostructured zirconia coating, Materials Science and Engineering: A, 424 (2006) 1-5. 22. Q. Zhang, C.J. Li, Y. Li, S.L. Zhang, X.R. Wang, G.J. Yang, C.X. Li, Thermal failure of nanostructured thermal barrier coatings with cold-sprayed nanostructured NiCrAlY bond coat, Journal of Thermal Spray Technology, 17 (2008) 838-845. 23. H. Zhou, F. Li, J. Wang, Microstructure analyses and thermophysical properties of nanostructured thermal barrier coatings, Journal of Coatings Technology and Research, 6 (2009) 383-390. 24. R. Lima, B. Marple, Nanostructured YSZ thermal barrier coatings engineered to counteract sintering effects, Materials Science and Engineering: A, 485 (2008) 182-193. 25. R. Ahmadi-Pidani, R. Shoja-Razavi, R. Mozafarinia, H. Jamali, Evaluation of hot corrosion behavior of plasma sprayed ceria and yttria stabilized zirconia thermal barrier coatings in the presence of Na2SO4+V2O5 molten salt, Ceramics International, 38 (2012) 6613-6620. 26. H. Jamali, R. Mozafarinia, R. Shoja-Razavi, R. Ahmadi-Pidani, Comparison of hot corrosion behaviors of plasma-sprayed nanostructured and conventional YSZ thermal barrier coatings exposure to molten vanadium pentoxide and sodium sulfate, Journal of the European Ceramic Society, 34 (2014) 485-492. 27. R. Ghasemi, R. Shoja-Razavi, R. Mozafarinia, H. Jamali, M. Hajizadeh-Oghaz, R. Ahmadi-Pidani, The influence of laser treatment on hot corrosion behavior of plasma-sprayed nanostructured yttria stabilized zirconia thermal barrier coatings, Journal of the European Ceramic Society, 34 (2014) 2013-2021. 28. X. Wang, L. Guo, H. Peng, L. Zheng, H. Guo, S. Gong, Hot-corrosion behavior of a La2Ce2O7/YSZ thermal barrier coating exposed to Na2SO4+V2O5 or V2O5 salt at 900° C, Ceramics International, 41 (2015) 6604-6609.